Journalist Hannah Vogel fled Germany in 1931 having kidnapped a young boy, Anton, reputed to be the son of Ernst Rohm, the feared leader of the Nazi’s storm troopers and a notorious homosexual. She has been hiding out in South America, but takes a zeppelin that is scheduled to stop in Zurich, travelling with her 'son' and hoping to meet her lover at a later date in London. However, the zeppelin is diverted to Munich and she’s soon in the clutches of Rohm and facing a forced marriage that will act as weak cover for the rumours concerning Rohm's sexual proclivities. Hours before the marriage, however, Rohm is victim to the Night of Long Knives when he and several hundred of his men are murdered by Himmler and his allies seeking to remove rivals within the Nazi hierarchy. Hannah survives but cannot locate Anton, setting out on a dangerous journey to find him before the Nazis do. 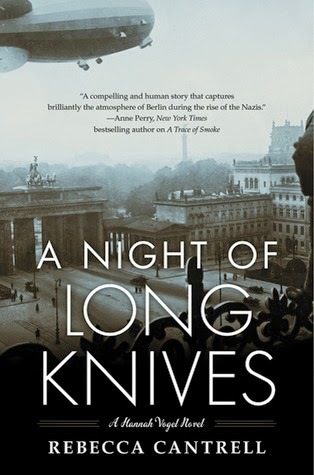 A Night of Long Knives is the second book in the Hannah Vogel series set in Nazi-era Germany. The book has a nice hook with its direct link into the infamous night of murder inside the Nazi party in 1934 and the hunt for a young boy who is supposedly the son of Ernst Rohm. There are some nice historical references, Cantrell recreates the stifling atmosphere of fear and suspicion of the place and era, and the story rattles along with plenty of intrigue and tension. That said, the story suffers from three main issues, two of which are partially issues of taste. The first person voice didn’t sufficiently resonate with me and my sense was the story would have been better told in the third person. Second, the story is infused with too much melodrama and has at times sappy tones that seem out of tune with the otherwise darker score. Third, although there is some tension and running around the story is far too linear and straightforward with the hunt for Anton being remarkably easy, with pieces and friendly allies very handily falling into place when and where needed. Overall then, an interesting read that in my view is a little hamstrung by its telling.